And even a Brand New Toyota Car! Put together the Ocean City Boardwalk Puzzle Game. You have 10 minutes to put the puzzle together. You are guaranteed to win. Once the puzzle is complete fill out Claim Form to create your account. You will then get an email with a link to claim your prize. 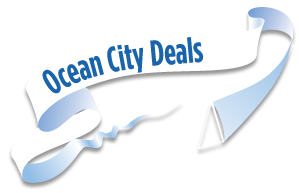 Invite your friends to OceanCityDeals.com and be eligible to play the OC Sand Dollars Scratch-Off Game. Scratch Off the designated areas and match 3 of a kind. If you get the Lucky 3 then you will win the prize noted on the screen. If you are a winner, then fill out the Claim Form and follow the instructions in order to print your prize voucher. Play our high score games and challenge your friends for bragging rights and prizes. If enough people play, then prizes will be awarded weekly. Play games such as "Crack A Crab," "Freddy's Fishing Fun," "Word Scramble," "OC Trivia" and more. New games added frequently. Win as much as you can. The more people that play, the better the prizes get, so spread the word. Vacation stays are based on availability. You must call the hotel to make reservations. One prize per game per visitor for Sweepstakes games. Unlimited prizes for "High Score" games. Each voucher has a unique validation code. Prize vouchers may only be used one time. Duplicates will not be accepted and will result in forfeiture of your prize. Some prizes may not be transferrable. Photo ID may be required.